With more than a "wink and a nod" from their collegial "caudillo del Norte," Donald Trump, seven right-wing South American leaders have launched the Forum for the Progress of South America (PROSUR), which aims to eradicate all vestiges of Venezuela's late president, Hugo Chavez, and Brazil's wrongfully-imprisoned past president, Inacio Lula da Silva. PROSUR seeks to replace the Union of South American Nations (UNASUR), which was created by Chavez and Lula in 2018 to counteract traditional American hegemonism in Latin America enforced by the neo-colonial Organization of American States (OAS). 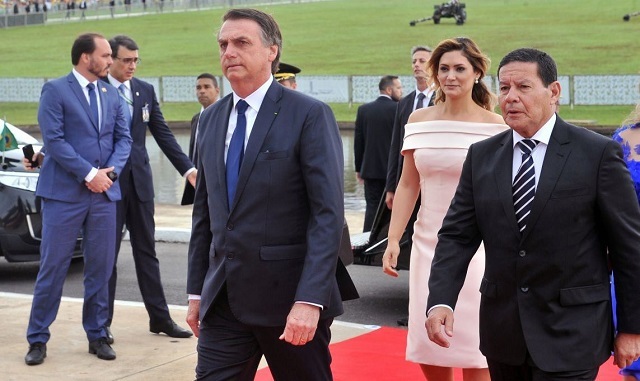 Leaders from seven right-wing South American governments Chile, Brazil, Colombia, Argentina, Paraguay, Ecuador, Peru, and Guyana recently gathered in Santiago, Chile, under the auspices of billionaire Chilean president Sebastian Pinera, to sign an accord creating PROSUR. One of the goals of the new bloc is to integrate the defense, security, and crime prevention infrastructures of the members. If that sounds like an embryonic recreation of the infamous Operation CONDOR of the 1960s and 70s, it very much has such potential. CONDOR was an alliance of the intelligence and security services of South American military dictatorships, nurtured by the CIA, that is believed to have been responsible for 60,000 murders, 30,000 "disappeared," 400,000 wrongful imprisonments, and countless acts of torture. Bolivia and Uruguay, members of UNASUR that support Chavez's successor, Nicolas Maduro, against the Central Intelligence Agency-groomed and -installed presidential pretender, Juan Guaido, did not join PROSUR, and, instead, elected observer status in the group. Pinera and Colombia's right-wing and narco/paramilitary-backed president, Ivan Duque, were the architects behind PROSUR. Seeing a chance to bury the legacies of Chavez and Lula, the two presidents invited all but Maduro's government to join the pact. Ecuadorian President Lenin Moreno quickly abandoned his commitment to the ideals of Correa, Lula, and Chavez and embraced the caudillo politics of the right-wing South America presidents. Moreno, whose first name is in honor of Vladimir Lenin, plunged a knife into UNASUR when he said it was the creation of "perverse politicking of the self-styled 21st-century socialists." After Argentina, Brazil, Colombia, Chile, Paraguay, and Peru withdrew from UNASUR, with the obvious prodding of the Trump administration, the stage was set for creating a new right-wing and pro-US alliance of neo-fascists, grifters, and oligarchs. Moreno, who served as Correa's vice president, has abandoned the socialist policies of his predecessor. Moreno not only welcomed US Vice President Mike Pence to Ecuador with open arms but sought the re-opening of the former US intelligence airbase at Manta, which had been closed by Correa in 2009. Moreno's defense minister announced that what would replace the Manta airbase would be a "Security Cooperation Office." In 2018, Moreno withdrew Ecuador from one of Chavez's most-prized creations, the Bolivarian Alliance for the Peoples of Our America (ALBA). Ironically, Moreno, who bears the first name of the founder of the world's first Communist nation, reversed many of Correa's policies aimed at reducing the influence of Ecuador's oligarchs and banks. Correa, who now lives in exile in Belgium, faces imprisonment in Ecuador in a political jihad launched by Moreno that is not unlike that of the Brazilian right-wing that targeted Lula and his successor, Dilma Rousseff. Present at the inauguration of PROSUR in Santiago was Argentine president Mauricio Macri, the one-time business partner of Donald Trump, who has done everything possible to imprison his predecessor, Cristina Ferna'ndez de Kirchner. Now an Argentine senator, Kirchner and her husband, the late President Nestor Kirchner, were partners of Chavez, Lula, and Correa in creating UNASUR. Uruguyan president Tabare' Va'zquez, who sent an observer delegation to PROSUR's inaugural summit in Chile without joining the group, criticized the new group at a United Nations conference in Buenos Aires. Va'zquez said that South America already had regional organizations, including the Common Market of the South (MERCOSUR), the Community of Latin American and Caribbean States (CELADE), and the Latin American Integration Association (ALADI). However, like Moreno of Ecuador, Va'zquez criticized the creation of UNASUR, saying, it "had a certain political ideology." One surprise leader who signed on to PROSUR in Santiago was David Granger, the president of Guyana. Granger, as a former Brigadier General in the Guyana Defense Force, likely felt at home with individuals like Brazil's Jair Bolsonaro, a former Brazilian paratrooper whose spoken Brazilian Portuguese reflects that of an uncouth Army veteran combined with a street thug. Granger has made common cause with ExxonMobil to lay claim to oil reserves in Guyana's Exclusive Economic Zone, which are also claimed by Venezuela. Granger has brandished his right-wing allegiances by ignoring Guyana's Constitution and postponing a March 19, 2019 required election to 2020. It was the defection of Granger's coalition government's parliamentary backbencher, Charrandas Persaud, to the opposition in a no-confidence vote that originally triggered the election. Rather than comply with the Constitution, Granger's government, accused Persaud of being a US citizen, not eligible to sit in parliament. Persaud also received death threats. Yet, according to the Western corporate media, Guyana is being threatened by an "undemocratic" Maduro government in Venezuela. Just as PROSUR seeks to eliminate the vestiges of Chavez, Lula, Correa, and Kirchner in South America, there has been an attempt by Washington to also wipe out two other Chavez regional projects, ALBA and the Community of Latin American and Caribbean States (CELAC). Both organizations include Venezuela's allies in the Caribbean region. Trump recently invited the leaders of five Caribbean nations Bahamas, Dominican Republic, Haiti, Jamaica, and Saint Lucia to his Mar-a-Lago billionaires' club in Palm Beach to seek their commitment to isolate the Maduro government of Venezuela and support the Guaido puppet regime. In order to entice the leaders to sever all financial links with Venezuela, including their participation in the PetroCaribe program that provided them with subsidized Venezuelan gasoline and oil, Trump offered nebulous loan guarantees through the Overseas Private Investment Corporation (OPIC), a Wall Street contrivance with major national debt pitfalls attached.